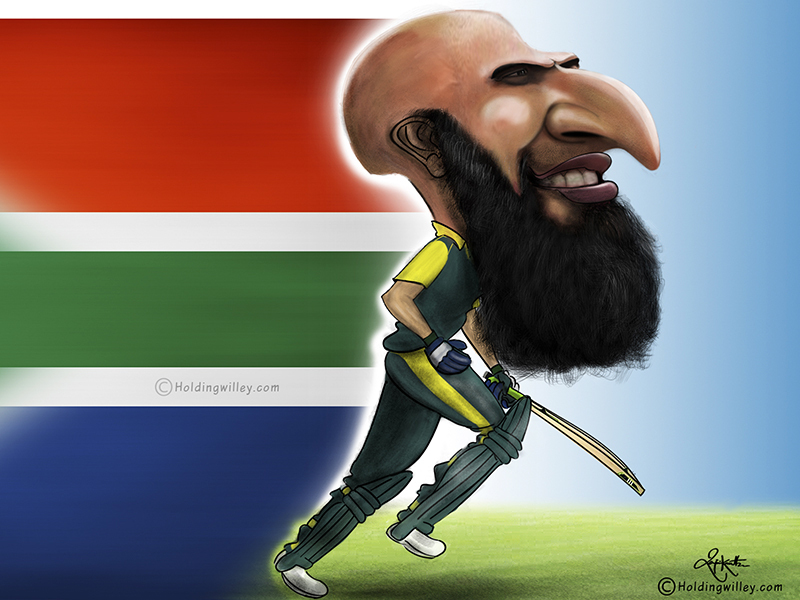 Hashim Amla is now entering the twilight of his career having done yeoman service for South Africa. He is a man of dignity whose behavior on the field is always exemplary and he has never been involved in an untoward incident. He has been part of a very successful South African team. He is part of a Test team full of players more big hitting than him, which is why he rarely gets the credit he deserves for such a long and illustrious career. However, the question that needs to be asked is whether he is just one of many good players in the history of Tests or a great one? Let’s analyze his Test career in detail. The table below shows Amla’s record all over the world. Unlike most batsmen from South Africa, Amla is equally adept against both pace and spin, with a good record all over the world. The table below gives his record in various countries that have a variety of different conditions. In Australia and South Africa there is pace and bounce. In Asia, the pitches are conducive to spin. In England & New Zealand the pitches offer a lot of swing and seam movement. The fact that Amla has a great record in all these different conditions is a feather in his cap that shows his class and pedigree as a Test batsman. Amla’s batting average in the first, second, third and fourth innings in Tests are 52.68, 47.25, 54.51 and 38.51. To nitpick, we could say that his average in the 4th innings is a bit on the lower side but it is still respectable. It shows that he is able to score runs irrespective of the vagaries of the pitch and deteriorating conditions. Even though Amla was a reluctant captain, he did not let the pressures of captaincy affect his run scoring ability. Amla has batted at the number 3 position in Tests in 156 out of his 193 innings in Tests. He has scored 7,593 runs at number 3 at an average of 52.72 with 25 centuries and 35 fifties. This is the 4th most runs at that position after Kumar Sangakkara, Rahul Dravid and Ricky Ponting. His 25 centuries are also the 4th most at number 3, again after Sangakkara, Ponting and Dravid. Amla has scored more than 1,000 Test runs in a calendar year on 3 occasions: 1,161, 1,249 and 1,064 runs in 2008, 2010 and 2012 respectively. He has also scored a century in both innings of a Test. Against India at Kolkata in February 2010 he scored 114 and an unbeaten 123. In that particular series against India, Amla scored 490 runs at an average of 490 in the two Test series. This is the 8th most runs scored in a 2 Test series in history and his average in that series is the 2nd highest of all-time. His performance made him one of only 5 players to score 3 centuries in a 2 Test series. Amla averages at least 40 against every Test playing nation other than Sri Lanka and Zimbabwe. This shows his consistency and emphasizes the fact that his high batting average is not because he feasts on weak opposition. He made his Test debut against India at Kolkata on 28th November, 2004. He scored just 24 and 2 in that match. In fact, Amla had a very poor start to his Test career. Since his Test debut at Kolkata till his 15th Test, against Pakistan at Lahore, which began on 8th October 2007, he scored just 714 runs at 25.5 with just the solitary century. From his 16th Test, which began on 8th November 2007, till the Test against Bangladesh at Dhaka which commenced on 30th July 2015, he scored 6,056 runs in 69 Tests at an average of 59.96 with 22 centuries. During this period, he was the 4th highest run-scorer in the world behind Alastair Cook, Michael Clarke and Kumar Sangakkara. He also scored the 3rd highest number of centuries behind Clarke and Sangakkara. His batting average during this purple patch was the 5th highest in the world after AB de Villiers, Sangakkara, Shivnarine Chanderpaul and Younis Khan. The fact that he was at the top in so many parameters shows that he was amongst the top batsmen in the world during this 8-year period. So far, the analysis of Amla has been restricted to numbers. What the numbers don’t tell you is the sublime grace with which he scores his runs. We can say that Amla is not just a prolific run scorer but also a great batsman with a voracious appetite for runs all over the world. South Africa will need him to fire on all cylinders if they are to get the better of Australia in the upcoming Test series.